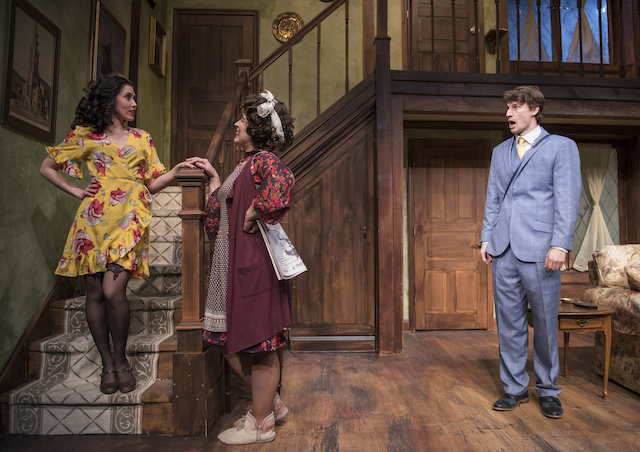 Windy City Playhouse presents NOISES OFF. Playwright Michael Frayn raises the curtain and the veil on the drama onstage, offstage and backstage. Drama from all these angles makes for a farce like no other. Frayn breaks up his play within a play into three acts: a technical rehearsal, a matinee a month later, and a performance late in the run. But the action onstage isn’t the real show. 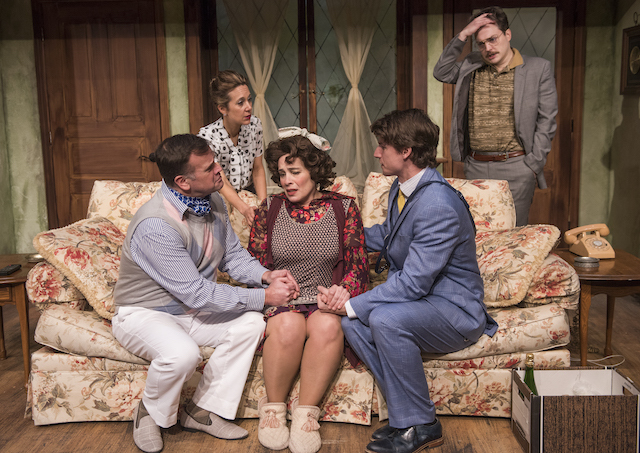 Frayn cleverly shines the light on the personal antics of the theatre company. The trysts, the gossip and the general shenanigans offstage is the focus. It turns an intended silly British comedy into an accidental madcap romp. Director Scott Weinstein impressively orchestrates this British farce. Act 1 introduces the actors and crew of Nothing On. Their technical rehearsal is going rough. Actors are fumbling lines and missing cues. One AWOL actor is suspected of being on a bender. A frustrated Mike Tepeli (director) yells directions from the audience. A frantic Erica Bitner (stage manager) responds from the stage wings. The actors muddle through the script and their lives with panache. Despite the continual screw ups, the English troupe support each other with ‘how are you my pet?’ and ‘it’s alright love!’. The kindness makes for a delightful posh lampoon. In Act 2, Weinstein has the audience move backstage for an intimate and hilarious glimpse to the inner-workings. The fourth wall is crushed as we see the backside of Scenic Designer Jeffrey D. Kmiec’s living room facade. The audience settles on makeshift chairs, including a perch in the rafters, to observe the action behind the scenes… literally. Although the show must go on and is going on in the other room, relationships are imploding backstage. Fights break out. Understudies are called up. An intricate game of hide the whiskey bottle is even at play. The perfectly synchronized slapstick is hysterical. 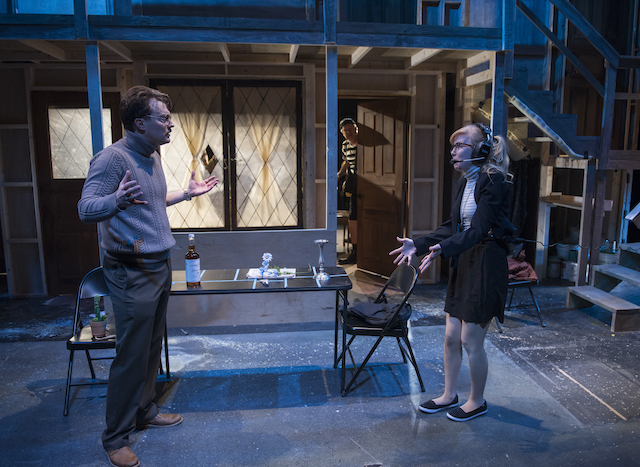 The comedy is heightened by the minimal dialogue and exaggerated gestures of hushed actors quietly unraveling as the play progresses. In Act 3, Weinstein sends us back to our assigned seats in the theatre. We are now viewing the remains of a show that has endured multiple obstacles. Frayn’s script is smart. Weinstein’s orchestration is innovative. 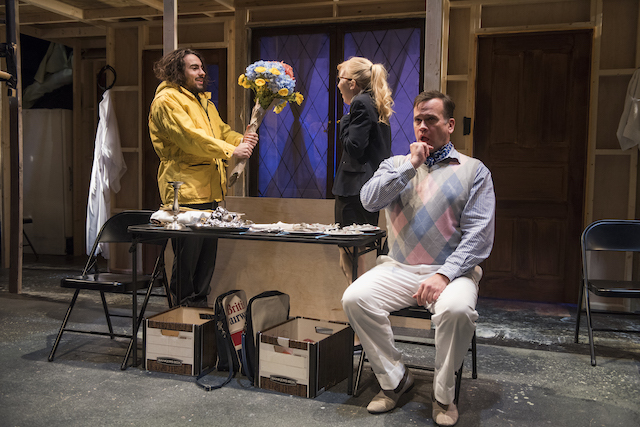 The ensemble (Tepeli, Bitner, Amy Carle (Dotty), Will Casey (Selsdon Mowbray), Scott Duff (Frederick Fellowes), Ryan McBride (Garry Lejune), Alexander Quinones (Tim Allgood), Amy Rubenstein (Belinda Blair), and Rochelle Thieren (Brooke Ashton) is terrific. Although I really enjoyed my first NOISES OFF experience, I’m not sure if aficionados of the staged cult classic will be as satisfied. NOISES OFF debuted in 1982 in London. It went to Broadway in 1984 and has enjoyed several revivals. 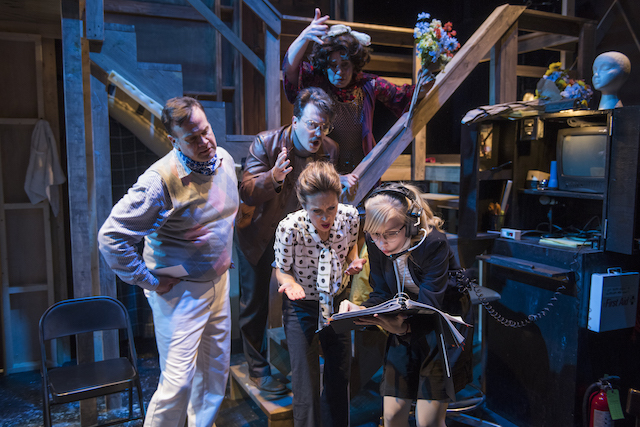 The show’s mechanics would be a challenge for any black box theatre. Not so for Weinstein at Windy City Playhouse. He provides a fun virtual reality for audiences to experience theatrical inner-workings. Although his orchestration is fascinating, after reading the playwright’s synopsis and notes, I believe Weinstein doesn’t quite facilitate the intended funnier caricatures.